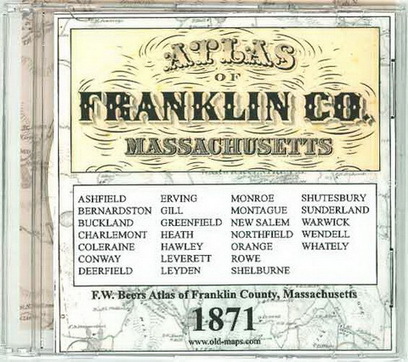 A CD ROM reproduction of the 1871 "Atlas of Franklin County, Massachusetts" by F.W. Beers. The old atlas mapped every road in the county and shows houses, schools, churches and businesses- with names. All maps and data on the original have been scanned for this reproduction. NOTE: This free low-resolution version is reduced in size for web use, so you will not be able to read homeowner names. All names are legible on our high quality reproduction on CDROM.